“Awesome Tabs” is a concrete5 Add-On that lets you create tabs (tabbed content) with Block Types, Layouts and Stacks however you’d like to combine these. Not just a “Content” field where you enter some text, images or HTML you need… Use your Block Types. Even nest tabs within tabs, go crazy! Extremely flexible, limitless possibilities for your tabbed content. Not limited to just one tabbed content per page, you can even go vertical and fade in your tabbed content. Simple setup and even when you switch your theme from Bootstrap to Foundation (or another framework), your tabs will keep working as expected. You could even have 2 active themes, one with Bootstrap and the other with Foundation, and have them both just work as they should. No need for choosing a “Template” for the Block Type, it will be done automatically. Only 1 simple Block Type is needed to make your tab dreams come true. No difficult setup with multiple Block Types or advanced dashboard pages. 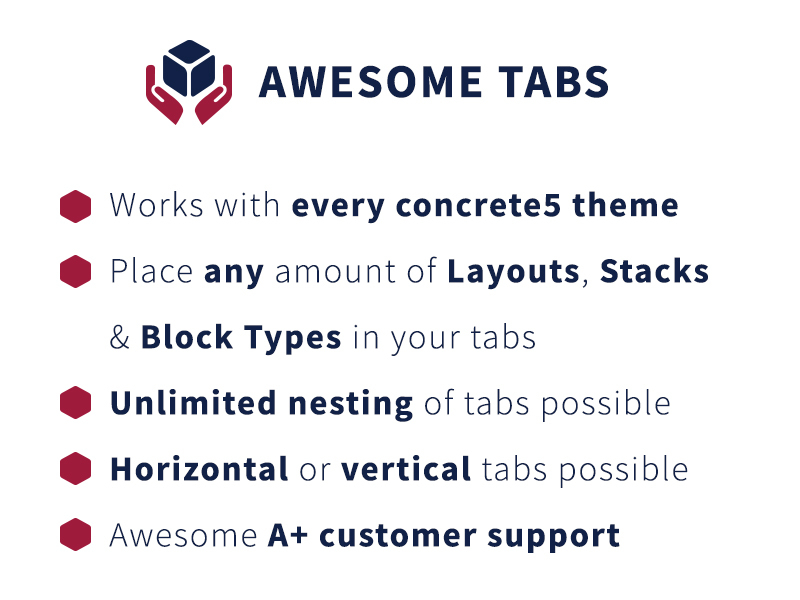 Do it all on the page you’re on, with the “Awesome Tabs” Block Type. See the "How To" page, how to make it all work! In case you’re using another popular framework, which has tabs with HTML implemented by default, let me know. I’d happily add more frameworks to this Add-On. Just let me know the framework name and its URLs (preferably both GitHub and website), so I can dive into the documentation and make it happen. This Add-On works with any concrete5 version, starting from 5.7.0.4. So yes, this works with concrete5 version 8.x (like version 8.4.2) too.